The KNYN/KACH Easter Egg Hunts Have Begun! 1. THE EGG IS NOT ON PRIVATE PROPERTY! NEITHER BUSINESS OR PERSONAL! Please respect the privacy and personal property of others, just like you would like them to respect your private property and possessions. 2. 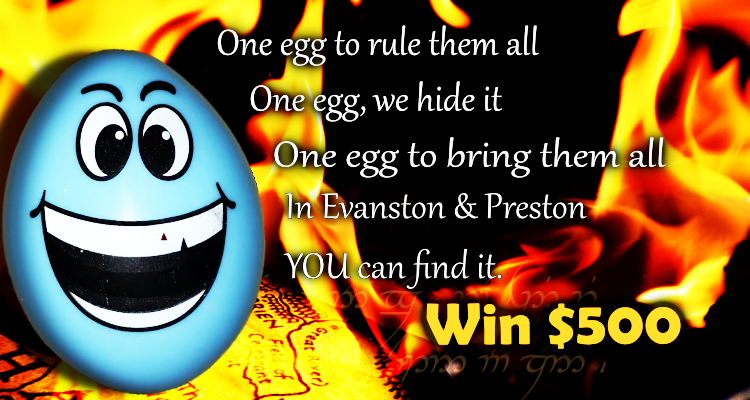 THE EGG IS NOT HIDDEN IN A PLACE THAT WILL PUT ANY PERSON IN DANGER! It is not anywhere near railroad tracks. It is not where a person might slide into a pond or river. Please, THINK SAFETY FIRST as you have fun in your search. 3. THE EGG IS NOT BURIED! You don’t have to dig anything up, pull anything out of the ground to find the egg. Let buried things stay buried! 4. DO NOT TAKE ANYTHING APART! If you find the egg you will know it. You will not have to take apart, unscrew, or alter any man made structure in any way to find the egg. The egg will only be hidden on city or county property that the public has access to on a regular basis. Once again, PLEASE RESPECT PERSONAL AND BUSINESS PRIVATE PROPERTY. If you have a question, please ask a business or resident near where you want to search if the land is public or private. 6. BASICALLY, DO UNTO OTHERS’ PROPERTY AS YOU WOULD HAVE DONE UNTO YOUR PROPERTY. Think “safety first”. Do not dig. Don’t unscrew, unwire or take anything apart while looking for the egg. Stay on city, state or county property that has general public access. Have some fun, and happy hunting! Different clues will be released each weekday. Different businesses might have different clues.